I knew that I was dying and was ready to leave my body and return "home". At that moment, I was thinking that perhaps this is the end for me and yet I have so many things that I have not done/completed for my own vows to Heavenly Mater! All the duties and responsibilities started to pull me down and to force me to return to my own body even though my heart was still hurting like hell. Suddenly Happy Buddha and the whole temple was surrounded and enclosed with bright white light. I saw Buddha's hands were "repairing" or/and "replacing" my heart in this bright white light. They are giving me another lease in life so that I may be with my family, my Tao members, and my own Tao mission yet again. I should have gone at age 39, it is now my 45th birthday and yet I may get another opportunity to live and to spread out the Great Tao to all around me. After my heart was "repaired", I sat still in this bright white light and felt renewed and refreshed. I again prayed and did 3,000 more kowtows to repay Buddha's merciful heart. After the bright white light disappeared, Happy Buddha told me that I shall follow my heart and keep my vows to him and to JiGong Living Buddha to spread out my story above to all the people around me and to talk about my 2nd chance in life. 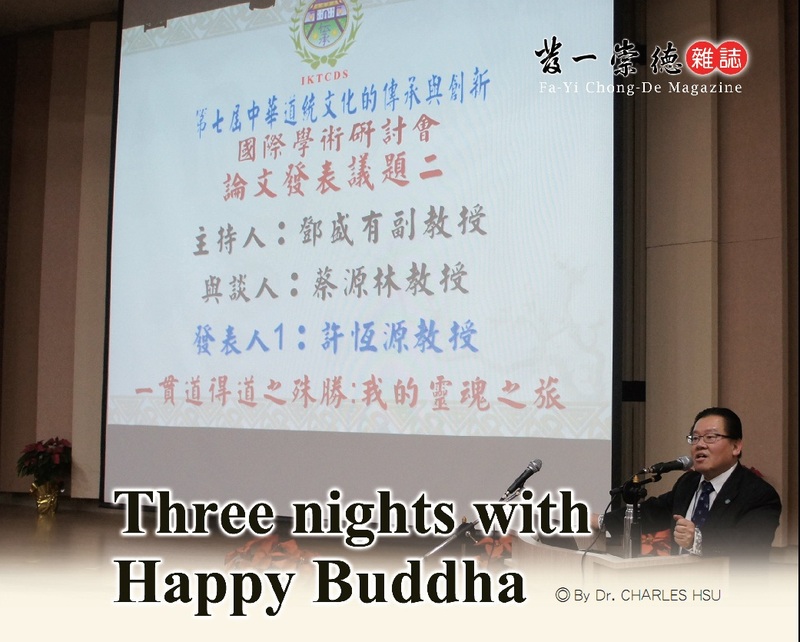 Happy Buddha also told me to learn about "公私分明"(Public and private have to distinct) and "聖凡清". Happy Buddha also told me that I have a duty to protect all Tao members and to support Chi-Chi, Ming, and June for your Holy Duty in the next 5~10 years. He also said to me that I need to learn to go beyond my own family and my own circle of friends to spread the Great Tao to this world. I told him that I wish to spread Tao to all around me in my school, in my companies, and in my classrooms, etc. He said that it is a great start but I need to go beyond just the USA and into China and other countries if possible. I then knelt down again and gave another 6,000 kowtows to Heavenly Mater, all Saints and Sages, you and my whole family, my whole circle of friends, and many many more people and beings that I do not even know to give me this 2nd chance in life to spread the Great Tao and to overcome any obstacle. All in all, I hope to be a new person with new purpose in life and march forward with my mission without any more hesitation! I spent another LONG night at Heng De Temple (7:30pm until about 3:30am) because Happy Buddha brought me out of my body and told me things that will renew my faith in Tao and in the Last Salvation. He told me that I would have a 3-night out of body experience (last night was the 2nd night). As usual, I am still recovering from my severe cold with high fever and my "heart transplant" all day yesterday. Feeling refreshed spiritually but very tired physically. After I had a simple dinner at home, I was "called" to Heng De Temple and began kneeling down to pray (while the evening ceremony incense is still burning). Of course, the three lamps were lit and I was kneeling in the middle pad. After another 3,000 kowtows, I could see myself leaving my physical body and entering the realm of buddhas and angels. Interestingly I always dress like I am going to work (with suit and tie) even in heaven! I was lead by Happy Buddha himself (he was just sitting there but was also everywhere I turned, looked up or down, etc.) to witness how my "diamond heart" was made. My diamond heart was made by thousands and thousands of little droplets of "faith" (初發心) from ALL the people (and non-people such as relatives/friends who have passed away) that I have ever spoken about Tao throughout my 45-year of life. Each little droplet contains the purest of heart from that particular person/being and little by little my diamond heart was made. It is not very big and not very strong yet because Happy Buddha told me that I myself have lost "faith" in Tao and in human beings. Even though I continue to go to the temple and to take care of the holy events (such as Tao Seminar and other ceremonies) my heart is no longer with Tao and with people. My heart was dying because of my strong doubt in people's faith and in Tao. As you know that I kept on telling you that I always thought people coming to the temple to take advantage of me and my family! I really did not like that at all but I ended up doing almost everything for them because I am the kind of person who is "公私不分"(Public and private not to distinct) and yet wish to look good in front of everyone! This kind of attitude and thought killed my faith in Tao and in people slowly but surely. At the same time, my original heart was dying. THREE of you will attain such status in this human world in the next 10~20 years. My duty and responsibility would be to help all THREE of you managing such great Holy Mission (including finance and logistics) in the future. My diamond heart is not yet strong enough to carry the Holy Mission myself but I can practice to speak about my out of body experiences to all our Tao members in Boston, in LA, and anywhere in the world first as senior lecturer Charles Hsu. I will begin talking about my experiences when Master Lu is in Boston and I will take Holy Affairs above my Earthly Affairs (重聖輕凡) vow seriously from now on. I definitely have had lost my faith in Tao and in the Realm of Heaven during the past few years after MuHsiao was born. I would have to begin my cultivation slowly and surely from the very beginning. You will be the one to be my sounding board and to help to spread out the words about my out-of-body experiences. Ming and June will also help to ensure that I have this story written in both Chinese and English (I can do the English part myself) so that I may be able to share it with all the people in this great Tao community. At the end, my fame, my earthly possession, and even my own physical body are NOT in my own control. Without this beating yet still weak and new diamond heart transplanted by Happy Buddha, I will NOT have a chance to see you, our children, and my whole family again in this life time! Since I am fl out this early morning, I would write this as my last day of spiritual journey ends with Happy Buddha at about 2:30am. Again, after my simple dinner (still with slight fever due to my cold and "heart transplant"), I was summoned to Heng De Temple again to kneel down and to pray for my fi of adventure with Happy Buddha. This time, Happy Buddha immediately transported me to the realm of angels. Somehow since I have spent nearly 100% of my adult life as an American, every single angel there (including Asian angels) can speak English perfectly and I see all walks of lives there such as doctors, nurses, engineers, garbage collectors, bar tenders, accountants, social workers, and even politicians as angels in this realm. This truly opened my eyes since I did not know there are so many angels walking and living among us. Happy Buddha told me that EVERYONE is an angel to someone else and I shall never look down at any person in this earthly world that I live in. I told Happy Buddha that I continue to learn about humility and to be as open as possible towards people around me yet with very little success. Happy Buddha said that I have been living in a super privileged life under Saints' and Sages' protection for my entire life. Even I did not turn out "bad" but I definitely turned out to be a little "brat". With my current MIT position, Harvard position, EBO, Foxconn, Zena, and other company offerings, I have been too "materialized" and "stuck up" with my titles, jobs, positions, and social status. I really did not know how to answer back to Happy Buddha and could only promised him that I vow to change. 1. Many people will walk in and out of your life, but only true friends will leave footprints in your heart. 2. To handle yourself, use your head; To handle others, use your heart. 3. Anger is only one letter short of danger. 4. If someone betrays you once, it's his fault; if he betrays you twice, it's your fault. 5. Great minds discuss ideas; Average minds discuss events; Small minds discuss people. 6. God gives every bird its food, but He doesn't throw it into its nest. 7. He who loses money, loses much; He who loses a friend, loses more; he who loses faith, loses all. 8. The tongue weighs practically nothing, but so few people can hold it. Of course, to me, I have heard of all the above before some time in my 45- year of life on earth. However, have I really lived a day like what they have said? I do not know. After JiGong Living Buddha left, I asked Happy Buddha questions about how I may find my Tao cultivation "male" companions here in Boston and in this world. Happy Buddha smiled at me and said to me that MuHsiao is one of the little angels who came down this earth to be my male companion (and I need to be good to him for sure). Of course, other young men in my life will also help me out. I shall lead a male-oriented Tao cultivation team that shall include Yang Lin, ReHao, Krishna, JF, Hsin-Hung, and Euclid if ever possible. Happy Buddha also said that he will send more male Tao members my way but I must also learn to accept them and to truly embrace their friendship and be true to them instead of "competing" with them all the time. The biggest problem that I have with other men is that I am too competitive without myself knowing it though. I did drive away many male cultivators simply because I did not know how to work closely with them and how to form great friendship with them. Happy Buddha said that as long as I put my mind into cultivating such long-term friendship and relationship, I will be just fine on the path of Tao cultivation. Honestly, I was truly relieved that Happy Buddha knew about my concerns and my unhappiness during my Tao cultivation. I promised him that I will change and will learn to bring more male cultivators to the temple to be my long-term friends and great help to the temple just like long time ago when I was so happy with many of my male friends here in Boston. All in all, these three nights were amazing and I truly believed that I have renewed the lease on my life and I have found true meaning to be a Tao cultivator. In addition, I believe that I will partner up with more male Tao cultivators and to truly bring my companions together to learn Tao and to walk the Tao path with our heads held high and proud!